I originally received a small container of this cream in the V.I.B box from Shoppers Drug Mart. You can sign up for the Shoppers V.I.B program here. I liked the sample enough that I went out and bought the cream as soon as my sample ran out. It is a bit on the expensive size, I paid $15 for the 112g jar. I really love the feel of the cream and it has a really nice light scent and washes off my fingers easily. I find some of the other diaper creams (especially Desitin) hard to wash off and they leave behind a (not so nice) smell. Baby has only had a small rash so far but the cream seemed to help quickly and I have been using it on an almost daily basis to help keep his bum clear. 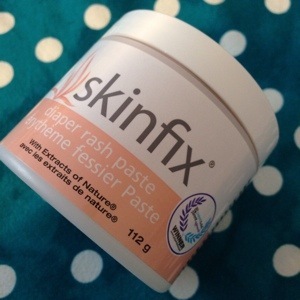 I do find that the Skinfix Diaper Rash Paste does absorbs more then other creams so I prefer to use a thicker cream (like Desitin) at night. My biggest complaint is that the cream is hard to find. Even though it came as a sample from Shoppers Drug Mart only 1 of our 3 carry it and of course it is the one I hardly ever go to. I like the Skinfix Diaper Rash Paste enough that I would make a special trip there to buy it again. Skinfix does have an awesome store finder on their website – it lists what stores carry their products but you can also search by your postal code to see the exact stores. You can buy it on Amazon (affiliate link). Ingredients: Allantoin, aloe barbodenis leaf juice, myroxylon balsumum, cera alba (beeswax), styrax benzoin resin extract (benzoin), ethanol, paraffin, petrolatum white, butyrospermum parkii fruit (shea butter extract), glycine soja (soybean) oil, helianthus annuus (sunflower) oil, liquidambar orientalis (styrax), prunus amygdalis (sweet almond) oil, buxus chinensis (jojoba) oil, tocopheral (vitamin e), zinc oxide 20%. Disclosure: I purchased the Skinfix Diaper Cream Paste myself and I was not compensated in any way for this review. All opinions are my own. This entry was posted in baby health, diaper cream, review and tagged baby, baby health, diaper cream, diapers, review on June 28, 2014 by Courtnie.